In the span of two weeks, half of our tomatoes died for no apparent reason. No worries, we had a few left, a handful of plants languishing in pots. So we transplanted, they grew tall and strong and looked promising. Then the worms and caterpillars struck. We first noticed a few tomatoes on the ground, pocked with holes. Then whole stems started dying, demolished by the worms. I sprayed. They lived. I sprayed again and nothing. I sprayed yet again, still nothing. I think I may have sprayed them with vitamins because they increased their harvest-ruining feast. At this same time our cucumbers started to die, assaulted by caterpillars. I tried everything from organic spray to Sevin dust and nothing worked. Since the cukes were almost done, we pulled them and vowed to try again in the fall. But that’s not all. Borers found their way past the sprays, dusts and compounds and killed our zucchini. The borers found their way into the part of me that wants to garden and have managed to eat most of that too. At the time of this post, our garden is ravaged – too thin in places, overgrow in others. Our zucchini is gone. Our remaining tomatoes look like hell. Our lemon cucumber, a tomato and two pepper plants fell victim to the summer heat and are gone. The only things doing well are our mint, pineapple sage, African blue basil and a few flowers. Our garden has been a disappointment, but we’re going to try again in the fall. Dig out our dirt, address drainage issues, put new dirt and compost and turkey manure down and try again. Maybe a crop of late tomatoes? Maybe a late zucchini? At the very least, we’ll grow some lettuce. Oh, I am sorry for your losses. But I was so glad to read your intentions to keep going. I've lost zucchini of all things and some other stuff too. But I'm convinced thast gardening hope springs eternal. And I'm getting revved with fall planting plans, too. My best wishes to you for a fabulous fall harvest. Thank you for the well wishing. We hope to have better results as the weather cools. Suckitude! Your garden experience this year sounds like ours last year. Disappointing and frustrating. And according to my dad, there is nothing out there to address squash borers - they just are what they are, and you have to start over. Good luck with the fall garden, I'm sure it will turn around! Ours was much better this year, with the exception of our heirloom tomatoes, which I strongly suspect Bender ate. 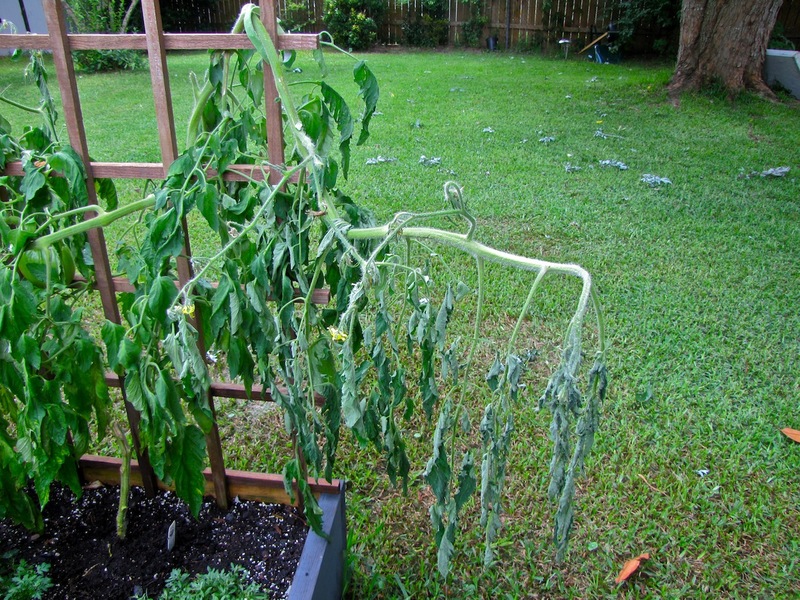 Any future tomato plants need to be labeled that they are "wilt resistant". Your Hungarian Heart might not be wilt resistant. There is a fungus or virus that lives in the soil and kills suseptable plants by clogging the transmission lines that bring water to the leaves, which is why they wilt when the soil isn't dry. The following sites are for California, however, information applies to other parts of the country. crop rotation is also important. If a tomato has died of wilt in a place, it is best to not plant a tomato in the same place for at least a year. May be that planting in pots next year with purchased potting soil will bring better results. Bleaching garden tools might be useful to reduce spread of the fugus/virus or what ever is causing the plants's death. B.t. Abbreviation for Bacillus thuringiensis, a bacterium that causes disease in many insects, especially caterpillars; formulations of the bacteria are used as insecticides. It is safe to use on edible crops. Thanks. Very helpful information. This conversation about the garden actually has lifted my spirits and hopes for a second crop.